All you need is a little chicken. And a few veggies of choice. 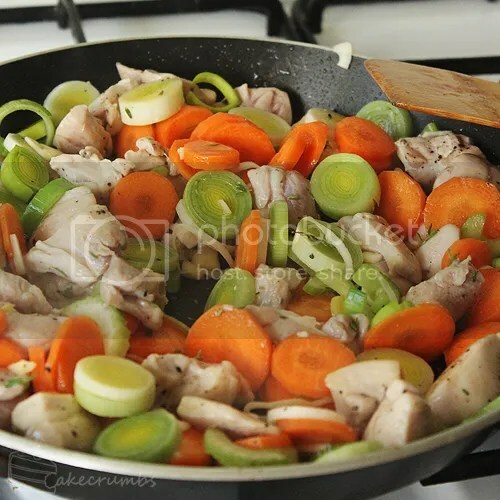 Carrot and celery work well as flavouring vegetables, but you can add as many as you like. I have to keep the veggies to a minimum when my sister's having dinner with us since there's so few she'll eat, but it's equally nice packed with them. Then you add some stock and some herbs and we're cooking. 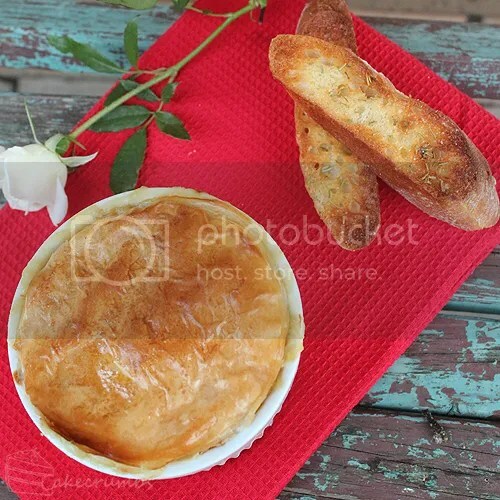 Once the casserole is done, you throw it in a few ramekins, top with pastry and bake. You can even skip the pots and just have the casserole with some mashed taters. But I'll take any excuse for some pastry. Filo pastry was my choice of poison this time. Mm, yes please! Heat a little oil or butter in a fry pan or skillet pan over high heat. 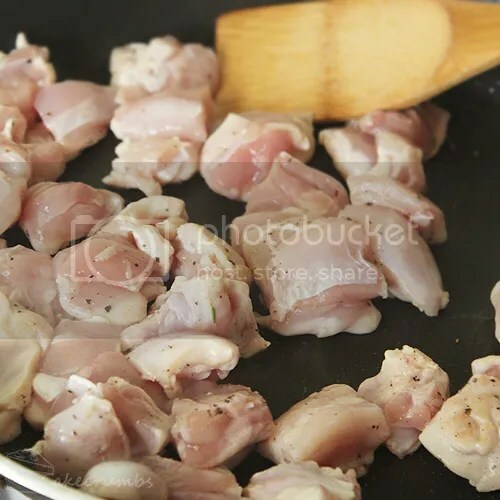 Season the chicken with a little salt and pepper, then cook until just browned. Reduce heat to medium and add butter, carrots, celery, leeks, garlic and thyme. 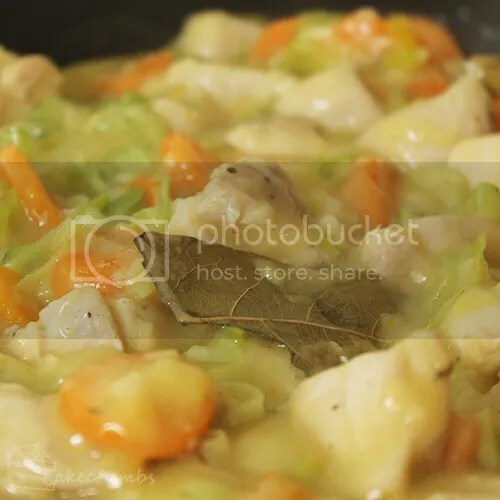 Cook until veggies have softened (approx 10 minutes), stirring occasionally. Sprinkle flour over veggies and stir until combined. Stir in stock; reduce heat to low and simmer for 20 minutes. Stir in lemon juice and cream, season to taste, then remove from heat. Meanwhile, preheat oven to 200°C (180°C fan-forced). 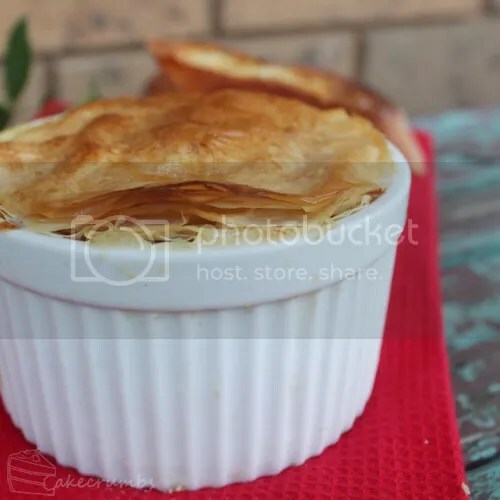 If using filo pastry, stack 10 sheets together and cut 6 rounds from them (giving a total of 60 rounds) or cut 6 rounds from the puff pastry. 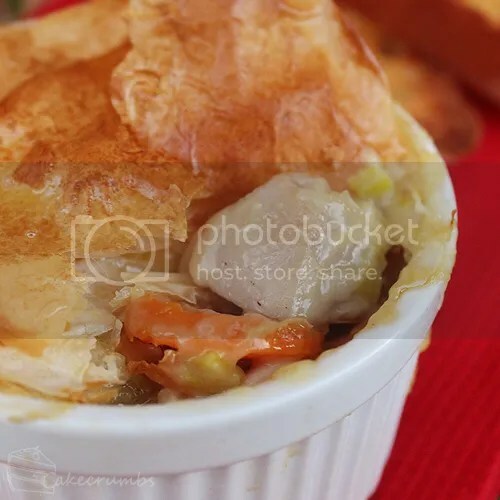 Scoop the chicken mixture into the ramekins, then top with pastry. If using filo, brush a little melted butter between each sheet of pastry. Brush pastry tops with more melted butter, or with milk or lightly beaten egg for puff pastry. Bake for 25 minutes or until pastry is golden; serve immediately. We are having an unseasonably warm spring here on the northside, but I *never* pass up the chance for hot chicken pastry! I’ll drink to that! Any excuse for pastry is a welcome one in my book. I know you would but ew oven on a 40C day. Is chicken breast an acceptable substitute for the thigh fillet? I don’t really like the taste of thigh. I am worried that the breast might be too dry.